Congressman Crowley advocated the advancement of Ukraine as a democracy and advised a movement towards transparency and a less corrupt government. He emphasized the importance of Ukrainian American community involvement in advancing U.S. government support for Ukraine. New York (Feb. 14)  Congressman Alcee Hastings (D-FL-23) met with members of the Ukrainian American community in New York City yesterday. The meeting was made possible by Congressman Joseph Crowley (D-NY-07) and the Ukrainian Congress Committee of America. Congressmen Crowley and Hastings presented their views on the current and future issues facing Ukraine and Ukrainians. Also present was the newly appointed Consul General of Ukraine, Mykola M. Kyrychenko. 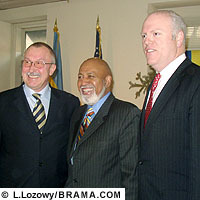 Congressman Hastings is a member of the Permanent Select Committee on Intelligence and President of the Organization for Security and Cooperation (OSCE) Parliamentary Assembly (PA). He is the first American to be ever elected OSCE President of PA. Mr. Hastings will lead the U.S. delegation to observe the upcoming Ukrainian elections, serve as the parliamentarian in charge of all international observers, and he will announce the final conclusion on behalf of the International Community. Mr. Hastings began by emphasizing that realities must be faced, although seemingly harsh. A unique set of circumstances exist in Ukraine in that its divergent internal vectors and its positioning between Russia and the West together make a mixture of complexities that will require "sustained hot diplomacy". He stressed the need for a strong, independent judiciary and the rule of law. Congressman Hastings underscored that "an election does not a democracy make" and that the situation will get better in Ukraine. "It's going to take time… Nothing is settled and we must work hard and stay vigilant." He also observed that "a democracy is a work in progress and by definition needs to take into account where people come from and where they are going." Responding to questions about the upcoming March 26 election in Ukraine, Congressman Hastings said that his experience as a judge provides a foundation for rising above bias, and that there are principles and standards that the OSCE sets and meets. His responsibility is to collate the information gathered by election observers, and he intends to "call it like I see it." In response to a question touching upon the constitutional reform in Ukraine and the referendum which Pres. Yushchenko has been calling for - Congressman Hastings stated "every reform produces a reform." However, the Congressman also emphasized the importance of Ukrainians making decisions for Ukrainians. Taking the floor after the congressmen, Consul General Mykola Kyrychenko presented a brief synopsis of the preparations being made for Ukrainians voting abroad in the March 26 election. He estimated that upwards of 3,000 voters will be casting their ballots in New York City alone.